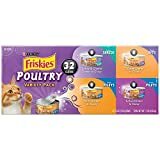 Keep your kitten or adult cat’s palate happy with the variety of delicious flavors in this Purina Friskies Poultry wet cat food variety pack. Each of this variety pack’s 32 meals is crafted to deliver nutrition that is 100% complete and balanced for the growth of kittens and maintenance of adult cats. Alternate between different recipes of rich, savory chicken and turkey to give her the high-quality protein she needs to help promote strong muscles and an active lifestyle. The different textures of poultry, from prime filets to savory shreds and meaty bits, gives her a range of consistencies that she loves and that keeps her running back for more at each and every mealtime. With eight cans of each flavor in this case, you have enough of each type for several dinners, or you can switch between flavors to keep each feeding varied and fun for her. Prime Filets Turkey Dinner in Gravy: Water Sufficient for Processing, Turkey, Liver, Wheat Gluten, Meat By-Products, Soy Flour, Corn Starch-Modified, Artificial and Natural Flavors, Salt, Calcium Phosphate, Added Color, Potassium Chloride, Taurine, Choline Chloride, Thiamine Mononitrate, Vitamin E Supplement, Zinc Sulfate, Ferrous Sulfate, Niacin, Calcium Pantothenate, Vitamin A Supplement, Copper Sulfate, Manganese Sulfate, Menadione Sodium Bisulfate Complex (Source of Vitamin K Activity), Pyridoxine Hydrochloride, Riboflavin Supplement, Potassium Iodide. D-6111. Meaty Bits Chicken Dinner In Gravy: Water Sufficient for Processing, Chicken, Menadione Sodium Bisulfite Complex (Source of Vitamin K Activity), Vitamin B-12 Supplement, Biotin, Folic Acid, Vitamin D-3 Supplement, Potassium Iodide. C-6100. Savory Shreds Turkey & Cheese Dinner in Gravy: Water Sufficient for Processing, Cheese, Soybean Oil, Dried Egg Product, Whey, Sodium Caseinate, Sodium Tripolyphosphate, Sorbic Acid (a preservative), Carrageenan, Potassium Iodide. D-6121. Prime Filets with Chicken in Gravy: Water Sufficient for Processing, Potassium Iodide. D-6113. Prime Filets Turkey Dinner in Gravy: Crude Protein (Min)…11.0%, Crude Fat (Min)…2.0%, Crude Fiber (Max)…1.0%, Moisture (Max)…80.0%, Ash (Max)…2.7%, Taurine (Min)…0.05%. Meaty Bits Chicken Dinner in Gravy: Crude Protein (Min)…11.0%, Crude Fat (Min)…2.5%, Crude Fiber (Max)…1.0%, Moisture (Max)…78.0%, Ash (Max)…2.5%, Taurine (Min)…0.05%. Savory Shreds Turkey & Cheese Dinner in Gravy: Crude Protein (Min)…9.0%, Crude Fat (Min)…2.5%, Crude Fiber (Max)…1.0%, Moisture (Max)…82.0%, Ash (Max)…2.5%, Taurine (Min)…0.05%. Prime Filets with Chicken in Gravy: Crude Protein (Min)…11.0%, Crude Fat (Min)…2.0%, Crude Fiber (Max)…1.0%, Moisture (Max)…80.0%, Ash (Max)…2.5%, Taurine (Min)…0.05%. Feeding: Feed adult cats 3/4-1 oz. per pound of body weight daily. Divide into two or more meals. Kittens need up to twice as much food as adult cats and should be fed all they will eat two or three times daily.